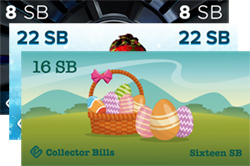 Every so often Swagbucks releases collector’s bills with a challenge to collect the entire set (Generally there are a few different SB bills). If you do manage to collect all of them, there is normally a reward of extra SB. The amount of bonus SB varies per set of collector bills. Each of the bills can be earned exclusively while searching online and generally have a certain theme. While searching you’ll be able to recognize when you win a collector bill, since it will look different than your normal SB bill. Once you earn a collector bill, you’ll be able to see it in your account under “My Swagbucks” next to the ledger. From there you can see how many you have left to earn, and you can share them on facebook or twitter (which does include a referral link). Once you successfully collect all of the collector bills you should get a message in your Swagbucks inbox telling you congratulations! Your bonus SB will be added to your account and you’ll be even closer to reaching your goal. If you don’t get a message or want to check to see how many more collector bills you need, go the the Collector’s Bills section under “My Swagbucks“. If you click the plus sign you’ll be able to see the bills that you’ve earned. If you see a symbol on the right, like the one in the image below, that says “collection complete”, then you’ve earned all the collector bills for that set and have earned your bonus!